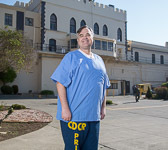 Creative Writing at San Quentin State Prison - 2015 Nov.
At a public reading of the inmates' work on Nov. 14, 2015, in San Quentin. The instructor is Zoe Mullery. These classes are sponsored by the William James Association, as part of California's Arts in Corrections program.